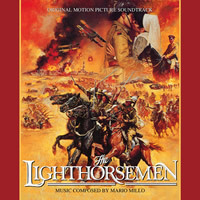 Dragon’s Domain Records, to be distributed through buysoundtrax.com, presents the soundtrack release of THE LIGHTHORSEMEN, the 1987 Australian war film directed by Simon Wincer (LONESOME DOVE, QUIGLEY DOWN UNDER) , written by Ian Jones (NED KELLY, AGAINST THE WIND), starring Peter Phelps, Bill Kerr, Grant Piro, Gary Sweet, John Walton, Tim McKenzie, Jon Blake, Sigrid Thornton, Shane Briant and Anthony Andrews, featuring music composed by Mario Millo (BRIDES OF CHRIST, CHANGI). THE LIGHTHORSEMEN is based on the true story of one of the greatest mounted infantry charges in history, which took place during World War I’s Battle of Beersheba on Oct. 31, 1917. The battle occurred near the end of the War’s Sinai and Palestine Campaign (1915-1918), where the British Empire struggled to drive German and Ottoman Turk troops out of the areas in the Middle East that had been occupied by the Ottoman Empire. The film dramatically portrays one of the finest moments of Australian expertise on military horseback, in the spirit of such previous Australian films as BREAKER MORANT and GALLIPOLI. As mounted infantry, the Lighthorse differed from cavalry, where in battle cavalry charged and attacked on horseback while the Lighthorsemen carried all their gear on horseback into battle, then dismounted to fight the enemy like regular infantry. THE LIGHTHORSEMEN was directed by Simon Wincer, a young television director who was brought into feature films through producer Antony l. Ginnane’s series of impressive Aussie horror films in the late ‘70s/early ‘80s. Wincer directed SNAPSHOT (aka THE DAY AFTER HALLOWEEN) and HARLEQUIN for Ginnane. Ian Jones, a prolific writer for Australian television since the late 1960s, had a keen interest in the history of his native country, and one of his early scripts for the Australian series MATLOCK POLICE featured a monologue from a former Lighthorsemen character who recounted the charge at Beersheba. Wincer, who was also directing episodes of MATLOCK POLICE at the time, saw the episode and was prompted to learn more about the charge; fifteen years later Jones showed Wincer his script for THE LIGHTHORSEMEN and that started the ball rolling. The cast was assembled primarily from Australian actors. To fill out the Lighthorsemen brigade, riders were recruited from all over Australia, performed under supervision of a Lighthorse expert. Award-winning cinematographer Dean Semler (DEAD CALM, THE ROAD WARRIOR, MAD MAX BEYOND THUNDERDOME) was brought in as director of photography. 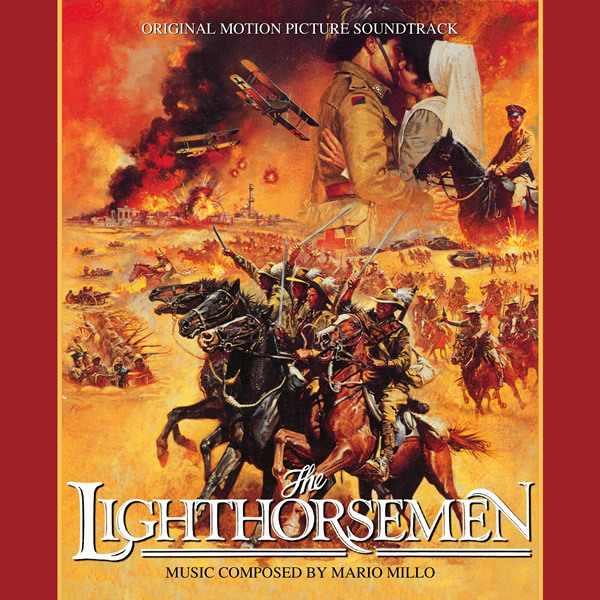 Composed by Mario Millo, the large-scale orchestral score for THE LIGHTHORSEMEN has gone on to be regarded as one of the great Australian film scores. It took Millo about 6-8 weeks to write, orchestrate, and record the music for the film. The score was recorded in Robert Blackwood Hall at Monash University in Melbourne. The recording was engineered by Roger Savage using Soundfirm’s mobile recording truck, and performed with musicians were from the Melbourne Symphony Orchestra, then moonlighting as the Victoria Philharmonic. The sessions were conducted by noted Australian composer/conductor William Motzing. Previously released on compact disc by 1M1 Records in 1991, Dragon’s Domain Records is excited to bring THE LIGHTHORSEMEN charging back into the marketplace, newly remastered by Digital Outland. The booklet includes exclusive liner notes written by author Randall Larson, with the participation of the composer and producer Antony I. Ginnane.